Before we start sharing our usual travel tips and recommendations, let’s take a look at the Phi Phi island group first. 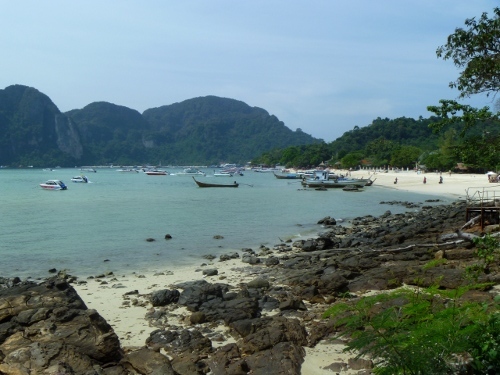 The Phi Phi Island that we usually talk about is actually the biggest island of the group which is composed of 6 islands. 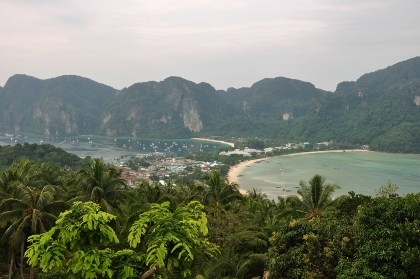 When you go to Phi Phi island, you stay at Koh Phi Phi Don because that’s the only island with permanent inhabitants. 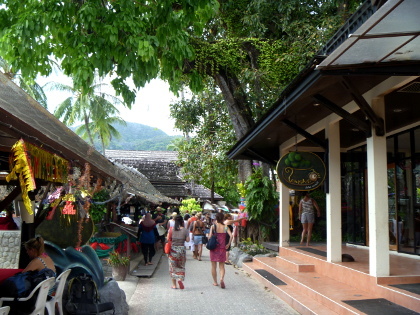 Koh Phi Phi Ley is a pretty popular island in the group as well. The rest of the islands are very small. There are no cars, no tuk-tuks, no scooters on the island. Everybody walks or you can ride a bicycle to get around. But walking might be more effective because the roads are pretty narrow and with people walking around, you can’t really ride fast. It’s very common to see people walking barefoot on the island. Don’t bother to use Google Maps app on the island because no specific roads will come up! In order to get around, a hard copy map is highly recommended. Don’t worry, you will get the map at your hotel or even the restaurants you go to. We followed our hotel location map to find our way. It’s pretty helpful to download a map on your phone before you land on the island. 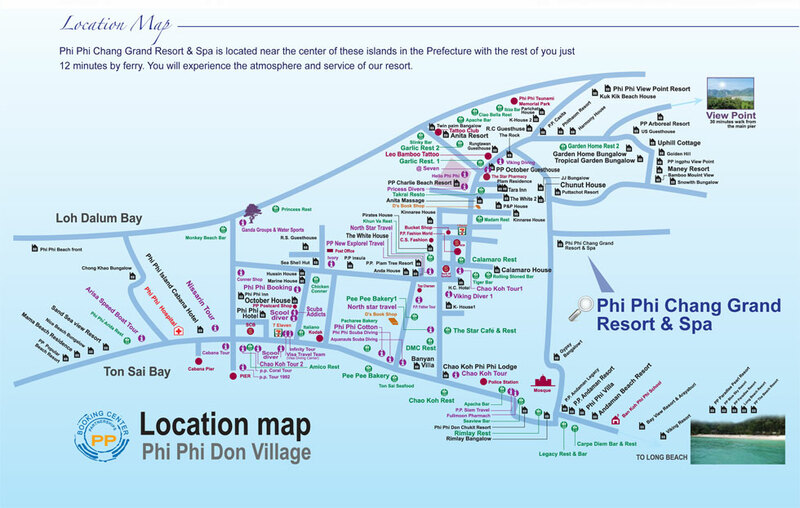 Our hotel Phi Phi Chang Grand Resort’s location map. Could be used as the island map too. We suggest you book your hotel on the island at least two months beforehand, otherwise you will have a lot less options to choose from. Since there are so many water activities and tours you can attend on the island, a waterproof bag is highly recommended. 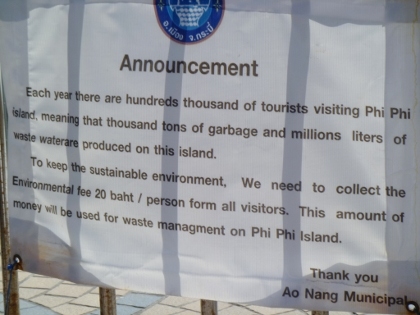 There is an environmental fee 20 baht for each visitor when you arrive on the island. 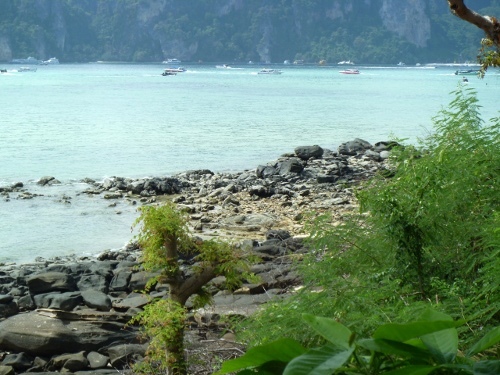 We had a pretty good experience staying at Phi Phi Chang Grand Resort. The location of this hotel is in the middle of the island but since Phi Phi is very small, we went everywhere by foot, so it’s not an issue. In fact, the hotel is super quiet at night. In terms of service, it’s great! Staff is very friendly and helpful. If you call them and tell them your arrival time beforehand, they will kindly arrange the pick-up at the pier. View Point is an absolutely must-see place. 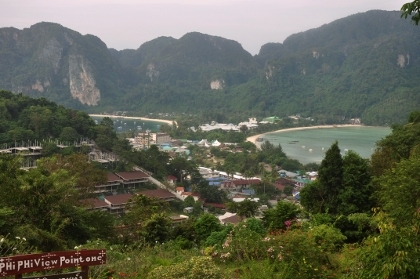 Please make sure you arrange 2 hours to go to this highest point of Phi Phi island. From there, you will see the most stunning overview of the island. Please note that there’s a 20 baht/person maintenance fee. Going up to the view point is quite challenging. 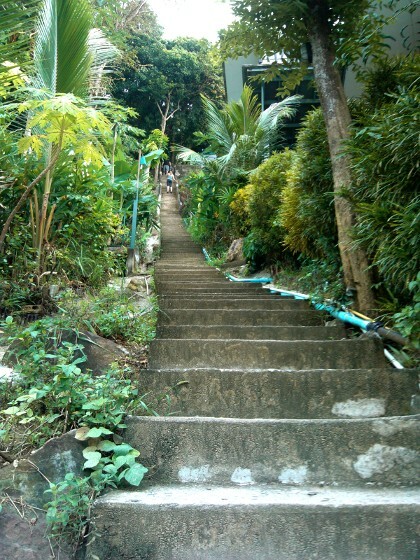 In order to get to View Point 1, you need to climb up some pretty steep stairs. That’s the most intense part. Prepare for some water or snacks. There is also a small bar surrounded by beautiful flowers on the top. You can buy some snacks and soft drinks there. You have to earn your way up to this breathtaking view point. Also, be aware that there will be some monkeys up there. On the way down, we encountered an aggressive monkey who’s trying to open up a coconut. When people passed by, the monkey probably thought that they were going for the coconut. It was not friendly at all. As soon as the coconut was opened (pretty impressive), the monkey started eating, then it ignored everything… See the video’s here. 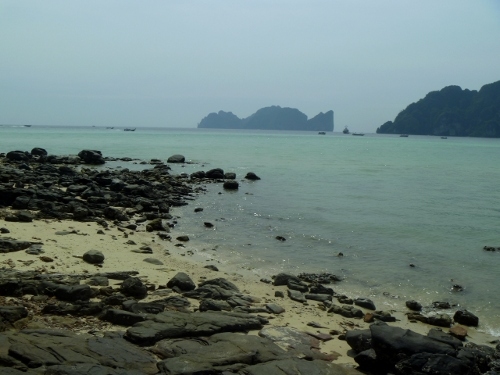 Long Beach is another highly recommended place to check out when you are on Phi Phi island. It probably requires a half day or more. We have heard only good things about this place. Check out the pictures we took on the way to the long beach. Unfortunately we didn’t have enough time to reach to it. It’s quite a long walk. If you want to have some active fun on the island, there are so many things you can do. We would recommend you to check out the Fantastic 3 in 1 Tour organized by IBEX Climbing & Tours. They manage to put up with cliff jumping, snorkeling, monkey beach, free BBQ dinner at a private beach, fireshow and night swimming with glow plankton all together. Want to find out what exactly it looks like? Check out our experience. 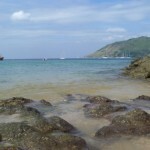 If you are interested in rock climbing on the gorgeous island, IBEX offers extensive climbing courses and tours as well. We joined Deep Water Solo with them and it was an amazing experience. Why IBEX? Let me tell you a bit about their background. It used to be called Cats and ran by foreigners. The current boss of IBEX who’s Thai was working for the company before the foreign boss who’s in charge of Cats left the country. The Thai bought the company over and changed the name to IBEX. 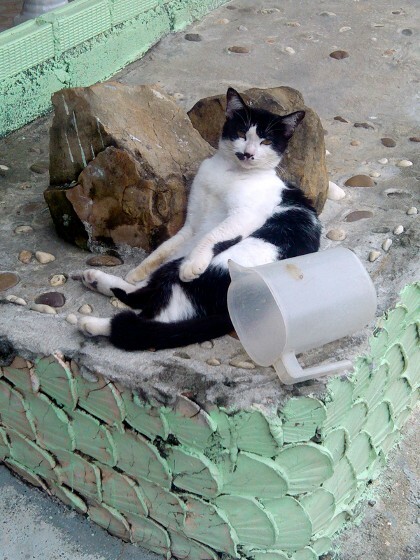 He has 10 years of rock climbing experience. So yes, these guys are pros. That’s pretty much it! Hope you find it helpful! :-) Please share it with other people if you think they will benefit from this post. Thanks!